Gymnast Gabrielle Christina Victoria Douglas was born in Virginia Beach on December 31st, 1995. At the 2012 London Summer Olympics, she won gold medals in both the team and individual all-around competitions. Gabby is the first African-American gymnast as well as the first woman of color of any nationality in Olympic history to become the Individual All-Around Champion. She is also the first American gymnast to win gold in both the gymnastic individual all-around and team competitions at the same Olympic Games. She was introduced to gymnastics by way of a cartwheel. Her older sister, Arielle, a former gymnast and competitive cheerleader, was determined to teach the toddler the sport she loved. Gabrielle immediately picked up her older sister’s love of the sport and soon taught herself how to do a one armed cartwheel. Gabrielle vividly remembers flipping around the house and off the furniture from the age of four. After a couple years of poking and prodding, Arielle convinced their mother to allow her little sister to train at a local gym. Once formal training began, another two years was all it took for her to be crowned the State of Virginia’s Gymnastics Champion. Gabby soon reached her peak at her local gym, quickly accumulating numerous victories and top finishes over the next few years. The task became clear: she had to convince her mother to allow her, the youngest, to move across the country in pursuit of her Olympic dream. This would allow her an opportunity to train with elite coach Liang Chow in West Des Moines, Iowa. Gabrielle left Virginia Beach at 14 to live with her host family, the Partons, while training with Mr. Chow. Under his tutelage she did develop the skills needed to reach the Olympics, and the rest, as they say, is history. 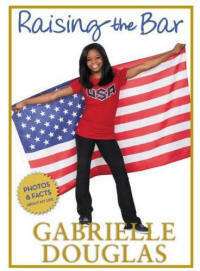 Here, Gabby talks about her autobiography, “Grace, Gold & Glory,” and about “Raising the Bar,” her inspirational book about how to achieve your dreams. Kam Williams: Hi, Natalie. Thanks for giving me an opportunity to speak with your daughter. You must be a very proud momma. Natalie Hawkins: Yes, I’m incredibly proud of the fight, determination and drive that I’ve seen in her and in my other kids as we’ve supported her through this journey. It’s just a wonderful feeling! But I have her right here for you. KW: Hi Gabby. I’d like to let you know how impressed I’ve been not only with your performances, but with the grace and poise you’ve exhibited off the floor. So, I’m very honored to have this opportunity to speak with you. GD: Thank you. My pleasure. KW: I have a lot of questions for you from fans, and I will be mixing their questions in with my own. What does it mean to you not only to represent your country in the Olympics but to make history by becoming the first and youngest American gymnast to win gold in both the individual all-around and team competitions? GD: Words can’t even describe how much it means, because of all the hard work, sacrifice and effort I put in at the gym, and also because of how much my family supported me and sacrificed their dreams for mine. It also means a lot to me, knowing that I became the first African-American to win the individual all-around gold medal. Not many girls in gymnastics look like me, so I’m honored and delighted to put a new face on the sport. KW: Grace Sinden says: Your muscles must get sore. What do you do for sore muscles? GD: Yes, Grace, my muscles do get very sore, but I have a massager. They call it “The Stick,” and I just rub it on my muscles. I also take ice baths and Epsom salt baths, and sometimes have to take Advil or Tylenol. KW: Grace also says: Your talent requires a lot of concentration. Is there anything special you do to help you concentrate and keep your balance? GD: Yes. Gymnastics does take great focus and concentration. What I do is look to my coach. He keeps me focused. And I meditate to get myself confident before the competition floor. That helps keep me focused, too. KW: Editor/legist Patricia Turnier asks: What interested you in writing your autobiography, “Grace, Gold & Glory,” at such a young age? Did you keep a diary? GD: I had kept many diaries, but I would start one and not finish it, and then start another one and not finish it. [Chuckles] I wrote the book because I had to overcome many challenges and hardships. I wanted to share my story to let anyone facing hardships know that your dream is still possible. KW: Patricia also asks: If Hollywood decides to turn the book into a movie, who would you like to play you? GD: I’d like to play myself, to be sure to capture my personality and my style. GD: Raising the Bar is all about my life now, since the Olympics. It’s kind of a picture book for younger readers. KW: Harriet Pakula-Teweles says: It’s been a while since the magic of the gold—how’s it goin’ now that things have quieted down—or have they? GD: It depends on the month. I’ll have a period when it quiets down, and then I’m traveling and on the go-go-go again. KW: Larry Greenberg says: I have a 5 year-old girl with an amazing, natural inclination towards gymnastics. Do you have any advice for her? And in a similar vein, Keith Kremer says: My 9 year-old daughter, Olivia, would like to know what advice you have for little girls who love gymnastics. GD: Since they’re so young, I would tell them to just have fun competing at Level 6 and Level 7. At their age, they’re just fine getting gift bags and going to banquets. I would tell them to be patient, take it one step at a time and just enjoy the ride. But also keep your goals and what you want to achieve in the back of your mind. I’d also tell any girl who continues to love gymnastics enough to want pursue a college scholarship to keep pushing yourself 100% in the gym every single day. KW: Patricia also asks: Do you plan to go to college? If so, where would you like to go, and what are you thinking about majoring in? GD: I would love to go to college, but right now my focus is on doing another Olympics. I can’t say where I’d like to attend yet. I’d have to visit some campuses to get a sense of the atmosphere, and what I like and don’t like. I still have a little bit of time. KW: What message do you have for young people who have big dreams but are not focused enough to put their plans into action because they believe in instant success without hard work and sacrifices? GD: That’s a hard question to answer, because even if you have the talent, you still have to push yourself. I don’t think dreams magically appear, that’s why they’re called dreams. But if you do want to make that dream a reality, then you have to push yourself. It takes a lot of hard work, and if you don’t have the focus, then it’s going to be all the harder. If you have a big dream, it takes all of the above to achieve it: passion, the focus and the effort. That’s definitely my advice. GD: I’m reading John Steinbeck’s “Of Mice and Men” right now. But the last book I finished was “Our Town” by Thornton Wilder. GD: I was just working out, so I had my music on. I think the last song was “Stomp” by Kirk Franklin. GGD: I rarely cook, but I really like to eat seafood. GD: Clothes designer? Well, I recently wore Donna Karan, and it was just fabulous! I love her clothes, so I’d have to pick her. GD: [Giggles] I don’t know. That’s a good question. When I look in the mirror, I see Gabby Douglas. GD: That’s a hard one. I don’t know. GD: I think I’d be a black panther. GD: What pops in my mind is my mom making pancakes and waffles for me and my siblings one night when we couldn’t fall asleep hiding in a tent after telling each other ghost stories. KW: Would you choose that because it’s hard to find privacy now that you’re such a big celebrity? KW: The Michael Ealy question: If you could meet any historical figure, who’d it be? GD: Anyone? Martin Luther King. He’s pretty amazing. GD: I’ve been so busy, I haven’t settled on a favorite one to work with yet. GD: Whew! I would love to be remembered as someone who inspired young girls never to give up on their dreams. KW: Are you willing to give me a Gabby Douglas question that I can ask other celebrities? GD: Yeah, I have one. Ask them: If you had to choose another profession, what would it be? 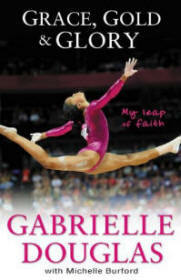 KW: Thanks again for the time, Gabby, best of luck with both books, and continued success with your gymnastics career. GD: Thank you, Kam. Here’s my mom. KW: Thanks again, Natalie. Gabby’s even more graceful and charming than I expected. NH: Absolutely! Thank you, Kam. It’s been a pleasure.